Pinterest aesthetics. I think, at this point, most of us are familiar with the concept, but for the few uninitiated, let me explain. Many writers create Pinterest boards for their WIPs to group together images that help them form an "aesthetic" for their work. Some lump everything together in one board, others create individual boards for different characters or settings. Some compile some of their images into a slickly edited graphic to be shared on social media. In fact, these aesthetics have become so popular a lot of writer hashtag games (think #authorconfession or #WIPjoy) have a prompt for writers to share their aesthetics or mood boards. So, are these Pinterest boards really useful or just another way for writers to procrastinate under the guise of planning their WIP? Of course, I think it all comes down to how you choose to use your boards, but I think that these boards can be a really effective tool for writers to plan their WIPs. Despite being a writer, I am not a highly visual person. Some people can close their eyes and see a movie reel of their story, their characters, their settings, and action from their stories. I am not one of those people. However, I do like having visuals to reference. Much like choosing music to write to, creating an aesthetic for your WIP can help you to determine not only the look of your characters or settings, but the overall feel and tone of your story. Everyone treats their Pinterest boards and aesthetics differently. Some writers I follow on Pinterest have public boards where they gather images and group them into boards under categories, like characters and settings, or they group them into genres. Personally, I have my boards set to private or, as Pinterest prefers to call it, "secret." However, whether your board is public or private, grouped by genre or into smaller boards for characters or settings within a WIP, a Pinterest board can serve as a great place to collect images you find inspiring. Personally, the kinds of images I have collected have helped to spark ideas for new scenes or served to help pull me back into my story when it feels like writer's block might take over. I tend to gravitate towards moody photos of clothing, landscapes, or artsy shots. I also tend to gravitate towards black and white images, but sometimes add different bits of color depending on what I'm writing and what the feel of that WIP is. Below is an aesthetic I made for my current WIP, which illustrates what I am talking about. This aesthetic combines photography with typography and quotes. I personally kept this aesthetic black and white because I want to create a feeling that this is a world that is bleak and desaturated. It also takes some inspiration from the black and white film noirs of Hollywood's Golden Age. These images, for me, evoke a look and feel I want to keep in mind as I write my WIP. When I'm feeling stuck with my writing or unsure of the direction in which my story is headed, I can refer back to these images. I find that they help provide both inspiration and a way to adjust and refine the tone and feel of my project. While I enjoy creating Pinterest aesthetics and find that they can help me to keep me interested and involved with my WIP, they absolutely aren't necessary. Pinterest can be a fun way to kill some time on your daily commute or to occupy you while you are waiting for your dinner to cook, but it can also turn into a massive time waster. 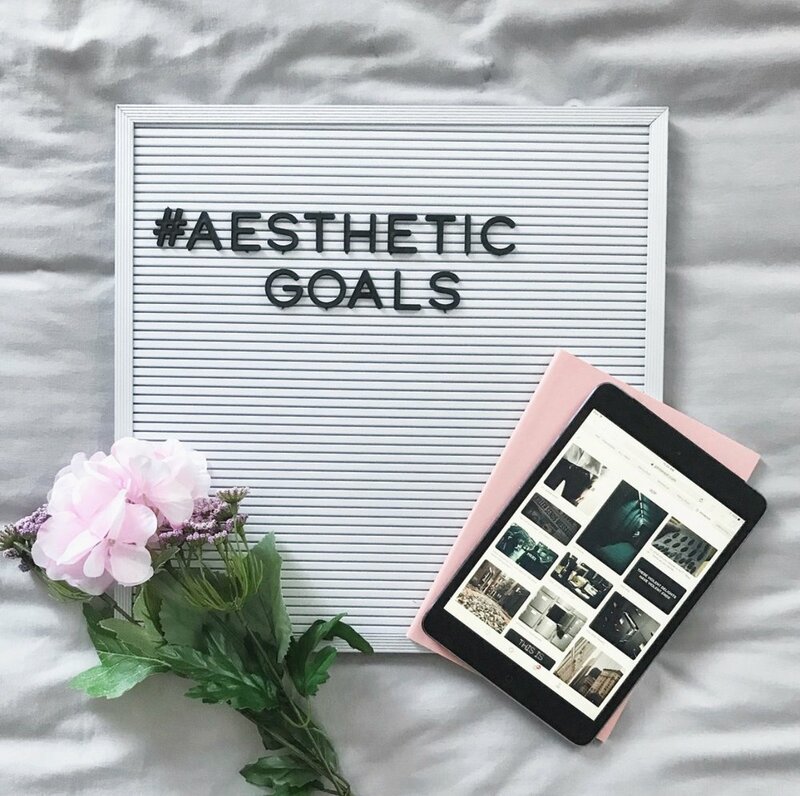 It is true that aesthetic boards can help you to more fully visualize elements of your story, it shouldn't be done to the detriment of your actual writing. Pinterest is great, but should be used as a tool for your writing and not as a means of procrastination. That's what Netflix is for.